This book comes with a free ghost! But, like any pet, ghosts need special care and attention. 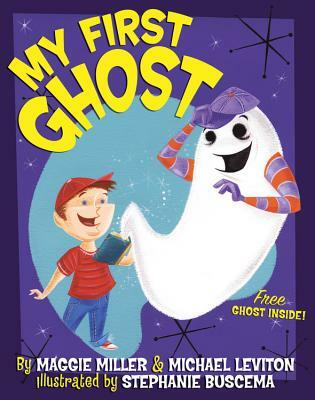 A playful riff on "My First Pet" books, My First Ghost teaches kids everything they need to know about taking care of their very own ghost. Debut picture book authors Miller and Leviton offer humorous tips on feeding, grooming, and ghostly games which are complemented by charming illustrations with a retro twist. Maggie Miller and Michael Leviton are a pair of ghost enthusiasts who wrote their first picture book to help children build healthier relationships with their phantom friends. Maggie is a student living in Iowa City, Iowa. Michael is a musician and memoirist who once worked as a ghostwriter. He lives in Brooklyn, New York. Stephanie Buscema has worked on everything from comics and children's books to rock n' roll art and gallery exhibitions. She has also illustrated the picture books "Pugs in a Bug," "Name That Dog," and "Maybe I'll Sleep in the Bathtub Tonight and Other Funny Bedtime Poems." You can see more of her art at www.stephaniebuscema.com.